Why risk damage to expensive spearguns, shafts, spearpoints and fins by packing them in a soft bag? The Sportube cases will protect all your gear whether you are checking it with the airlines, shipping it via FedEx/UPS or just loading it in the back of the truck. Three models to accommodate many lengths of spearguns and gear. Depending on the amount of gear you need to travel with, the Sportube Series 1, Series 2 and Series 3 will all work for you. If it's just for yourself, you are good with a Series 1 or Series 2. But for guided trips or to reduce the number of bags you're using, the Series 3 is perfect for consolidating the groups gear into one Sportube. 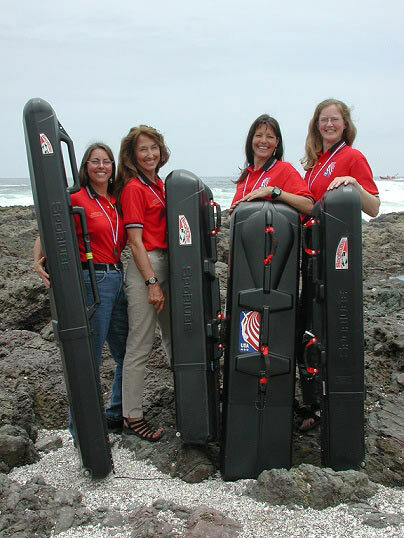 "Sportube was chosen by the USA Spearfishing Team for the safety, security and ease in packing and traveling. In one Series 3 Sportube I was able to carry 9 spearguns, a full suit, a pair of fins and most of my small accessories. They are easy to adjust to any size load and have a durable set of wheels for easy travel." "Your lightweight and very durable Sportube product enabled me to take the necessary spearguns and dive equipment I needed yet stayed within the rigid checked luggage weight restrictions when traveling to Iquique, Chile last year. After 34 hours of flight and four plane changes, it was reassuring to know that my three spearguns & shafts, Matrix fiberglass fins and other dive gear traveled without harm (or extra baggage fees!) in my Series-2 Sportube. Thank you for having such a reliable product!" This fits two guns easily or one gun with all the rest of your stuff sans fins. Wish I got the next size up to fit my fins. It is an industry standard for spearos. Great case, but here are some things I would suggest you get with it. First a TSA lock or something else if you aren't flying. Second if you don't have enough spearing gear to pack the case your guns will rattle around and get damaged. I wish they would include some kind of a foam insert for the money.